art installation by James E. Kennedy Jr.
detail of installation by James E. Kennedy Jr.
An exhibit of site-specific works informed by Capp Street Project Archive, created by the undergraduate students in the UDIST course "Activate Archive: Capp Street Project": Star Barker, Can Caglayan, Austin Conrad, May Han, Elizabeth Hohimer, James E. Kennedy Jr, Rosa Novak, Tessa Shimizu, Brandon Treakle, Malaya Tuyay, and Jessica Young. "Activate Archive: Capp Street Project" was taught by CCA faculty Kari Marboe with archives collaboration from Capp Street Archives Curator Jennine Scarboro. 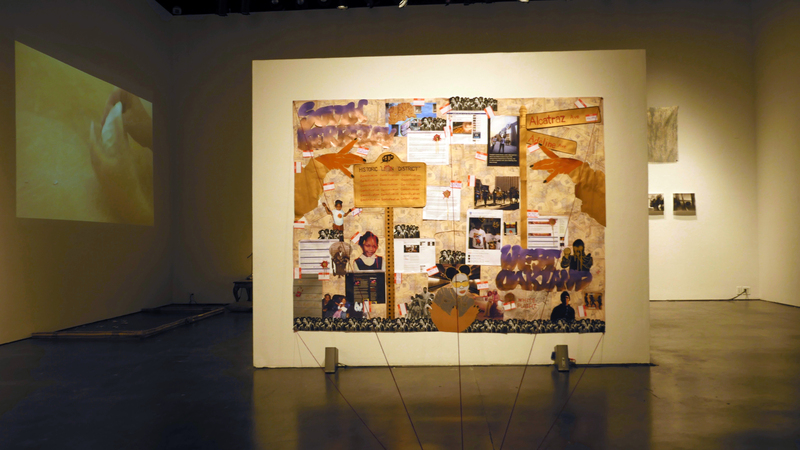 The works were displayed at the Oliver Art Center, on California College of the Arts' Oakland campus, in December 2016. Photographed by James E. Kennedy Jr.